There is a rather gaudy multi-coloured variety which is named 'Rainbow Surprise' - it is a mixture of reds, greens and lolly pink, and is rather jolly. I'm not totally sure if I like it, but I'm trying several plants out. They'll certainly brighten up the winter borders. My favourite Coprosma is a more subtle combination of pinks and reds, and I have this planted in several borders as well as a fine specimen in a pot on the house decking. It looks particularly good near pink and red roses. Some of my coloured Coprosmas live in pots, very happily, and they survive winter on the decking. I also have pruned them very heavily, and although slow to regrow, all is now well. 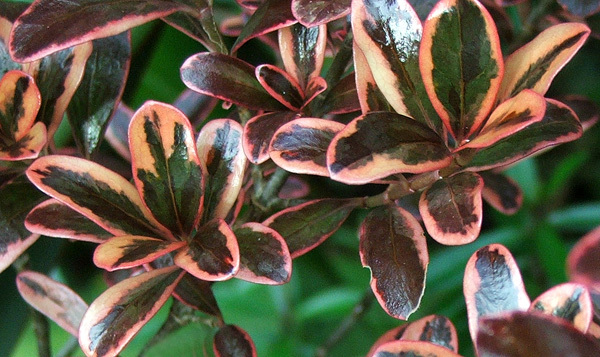 More gardeners could easily grow these beautiful small New Zealand hybrid Coprosmas - they are particularly colourful to have in a mixed border, and they will accept a big pruning session without too much sulking. I suspect it is quite difficult to kill one! It is possible that the smaller plants get frost damaged. This happened to a cream and green variegated shrub which was growing in an unsheltered new garden area. That particular winter was rather frosty, though. Since then I've always treated my Coprosmas as half-hardy.